Portland Pushes Streak to Nine with Another Win Over Warriors. 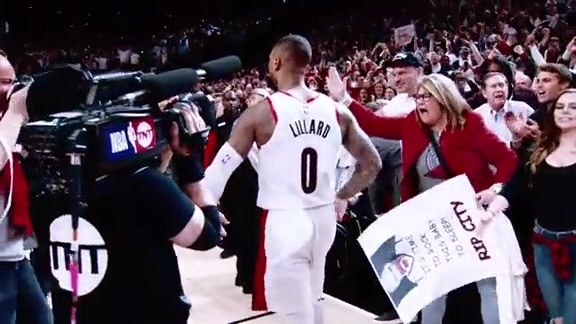 PORTLAND – Portland ran its season-long win streak to nine straight games by defeating Golden State for the second time in less than a month by a count of 125-108 in front of a sellout crowd of 19,487 fans at Moda Center Friday night. CJ McCollum’s 30 points and Damian Lillard’s 28 led the way for Portland once again, but it was the Trail Blazers bench that made the difference. Portland’s reserves outscored their Golden State counterparts, 47-18. Four Trail Blazers scored in double figures off the bench (Zach Collins-12, Evan Turner-12, Ed Davis-10, Shabazz Napier-10). Davis added a season-high 15 rebounds. The Trail Blazers’ nine straight wins marks their longest streak since November 9-26, 2014 (also nine games). Portland’s 11-game run from Nov. 8-25, 2013 is the only streak since 2012-13, when the likes of Head Coach Terry Stotts and Damian Lillard joined the team, longer than the current streak. “I’m proud of it but we’ve got to keep going," said Lillard of Portland's win streak, which is now the longest currently in the NBA. "I think we’ve done a great job of being sharp in practices and when we go in the film room, we’ve been taking our game seriously. Not that we haven’t all season, but I think lately it’s a different level of focus, it’s more intense. It’s a different excitement amongst our team." What’s most impressive is that Portland’s winning streak is now bookended by victories over last year’s champions. It all started with a 123-117 win over Golden State in the final game before the All-Star break on Feb. 14. The nine games also include wins against division rivals Minnesota, Oklahoma City and Utah. The Trail Blazers are now 40-26 on the season, a season-best 14 games above .500. With 15 wins in its past 16 home games, Portland is now 22-11 at Moda Center. Portland’s Northwest Division lead currently stands at 2.5 games over Minnesota and Oklahoma City, while the Trail Blazers are 1.5 games better than New Orleans for the third spot in the Western Conference. "I think we’re all very much aware of what the standings are and there’s not a team in that group 3-10 that has the luxury to get too excited about anything one way or the other," said Stotts. "All eight of those teams are battling and there’s not a lot of room to breathe." • CJ McCollum led the Trail Blazers with 30 points on 10-of-19 shooting from the field and 5-of-7 shooting from three to go with four rebounds, an assist and a block in 38 minutes. • Damian Lillard went 8-of-21 from the field, 4-of-10 from three and a perfect 8-of-8 from the free throw line for 28 points to go with eight assists and four rebounds in 37 minutes. • Both Ed Davis and Jusuf Nurkić finished with double-doubles, with Davis going for 10 points and a season-high 15 rebounds while Nurkić added 10 points and 11 rebounds in 20 minutes. • Evan Turner and Zach Collins both came off the bench to score 12 points while Shabazz Napier went 3-of-7 from the field for 10 points in 16 minutes. • All told, seven Trail Blazers scored in double figures compared to just three for Golden State. • After scoring 50 in a losing effort in Portland on February 14, Kevin Durant netted 40 points on 12-for-21 FG (6-12 3-PT). Klay Thompson added 25 and JaVale McGee finished with 10 points to round out Golden State's double-digit scorers. • The Trail Blazers won their ninth game in a row, extending the longest active winning streak in the NBA. The last time Portland won nine games in a row was Nov. 9 - 26, 2014. • Portland won its sixth straight home game and improved to 15-1 in its last 16 games at Moda Center. • The Trail Blazers improved to 2-1 against the Warriors this season, earning two victories against Golden State for the first time since the 2013-14 season. • Portland has won its first eight games after the all-star break for the first time in franchise history. • The Trail Blazers scored 125 points, the second-most points they have scored this season (127, Nov. 24 at Brooklyn). • Portland outrebounded Golden State, 46-33, and outscored them in the paint, 40-36. • The Trail Blazers had 14 offensive rebounds leading to 26 second chance points. The Warriors had six offensive rebounds leading to eight second chance points. The Trail Blazers host the Miami Heat in the third game of their five-game homestand Monday night as they go for 10 straight wins. Tipoff from Moda Center is scheduled for 7:30 p.m. on NBC Sports Northwest, ESPN and NBC Sports Northwest Rip City Radio 620 AM.